The following sponsors are providing additional prizes to the 50/50 drawing. Free products, from these businesses, are waiting all teams who become members of the R & B Bass Circuit. First team out of the money? Its not bad news: you earn the D's Award! 1st Place: Mitch Bair and Steve Grim of Columbia City (pictured right) returned to R & B for the Webster event and dominated the field. 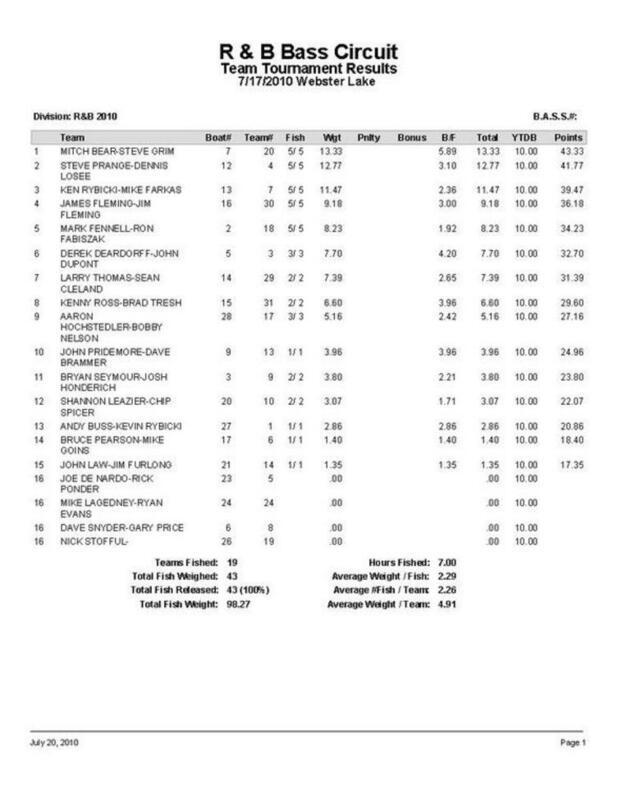 The team previously only fished the Maxinkuckee event where they finished 3rd. 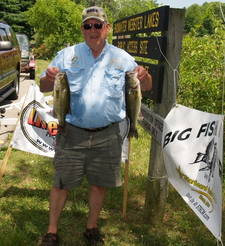 Picking up where they left off, they won this event, winning $438 They also caught the Starboard Choice Marine Big Bass: a 5.89# toad earning them another $190. The winners landed the big fish on a Joe Bass Lures Max Jig, but caught the rest of their fish on drop shot rigs worked between 7-13 feet of water. The day actually did not begin well for the team as they started in the Backwaters. At 10:00, they had not landed a keeper and took off for the mainlake. They quickly landed their first keeper, the big bass, and were efficient the remainder of the day by hooking and landing all 5 legal-sized bass that bit. 2nd Place: After a mediocre start to the season on Winona Lake (8th place), Steve Prange and Dennis Losee have been on a tear. They won the Maxinkuckee event, finished 5th at Diamond, and now were runner-up at Webster. They admitted in advance that they had a rough time in practice locating quality fish, and even stated beforehand that what they had, "Won't put us in contention." A bit of an understatment. This high finish put them less than a point behind the leader in the year-to-date standings. They were the only team to cull fish and finished with a limit that weighed 12.77# that won them $310. They caught all of their fish on Prange's homemade jigs. These jigs are not for sale! 3rd Place: Like Prange and Losee, the team of Ken Rybicki (pictured left) and Mike Farkas began the season with a mediocre finish on Winona Lake (11th place), but have finished in the money ever since. They located a weedbed in practice and then soaked it for all it was worth during the tournament. 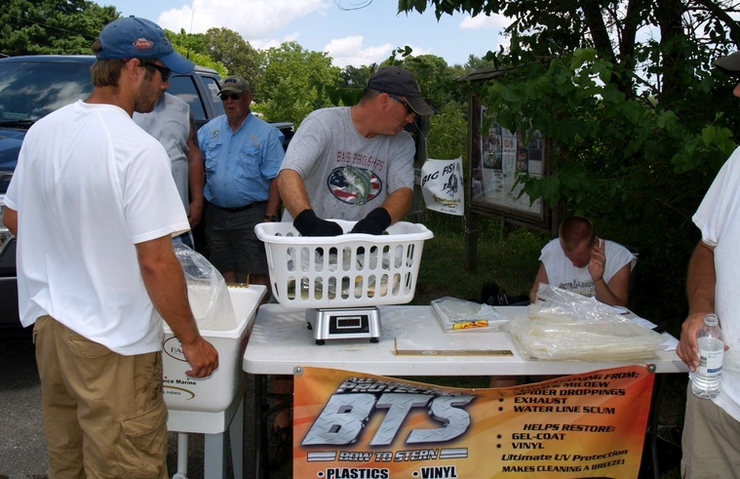 They caught 5 keepers that weighed 11.47# and won them $224. As in the past, they caught all of their fish on wacky worms. 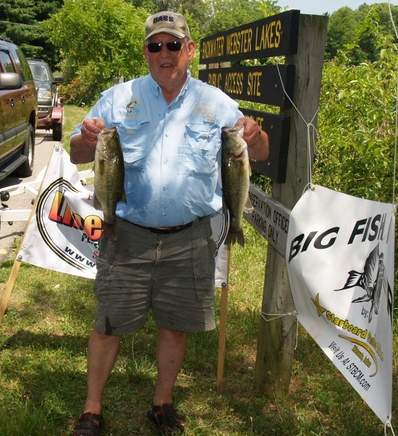 4th Place: Newcomers, James & Jim Fleming, caught their fish early on the mainlake. The father-son team used a combination of jigs and Yamamoto hula grubs to catch a limit weighing 9.18#. They won the D's Lures Award. 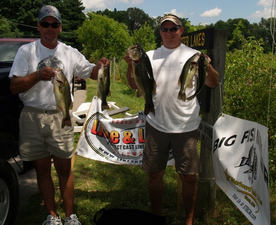 Mitch Bair (right) holds in his right hand the 2nd largest bass of the 2010 R & B season. View all the Records.